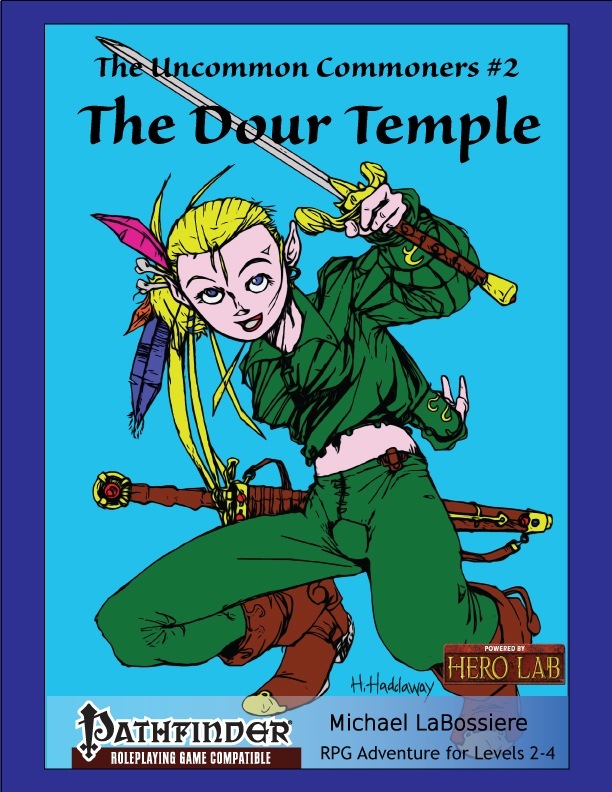 "The Dour Temple" is the second book (of seven) in The Uncommon Commoners campaign series. In this semi-epic campaign, the uncommon commoners will fulfill their destiny. Or die trying. Or both—if their destiny is to die trying. Bandits of wildly varying competence have begun accosting even old men and their old horses. Dour dwarf followers of the much-too-serious god Unjoi have taken over an abandoned temple of Baccarus, kicking out the semi-famous acting troupe of Caviolo & Son. A joyless druid has begun converting the joyous beasts of the woods into sober, hard-working dour beasts. It is up to the uncommon commoners to face the perils of the MandaTory Bandits, to endure the acting of Caviolo & Son, to rescue the beasts from dour dullness, and return joy to the Dour Temple. Can the uncommon commoners save the day? Or will they fall victims of an uncommon dourness? The Uncommon Commoners #2: The Dour Temple is a Pathfinder Role Playing Game compatible adventure. It is intended for a party of 2nd-4th level uncommon commoner characters. While the adventure is written to be humorous and fairly light, it is also designed to be suitable for serious game play. Fully developed NPCs, complete with detailed descriptions, backstories and motivations. And loot. New domains & subdomains (Dour Domain, Revel Domain, and Wine Subdomain). New Spells (censor, create wine, inebriation, and sobriety). New Magic Items & Equipment (dour bar, rock water, acorn vest, The Mace of Vicious Mercy, and Vest of Devouring Squirrels). 44 pages of adventure (includes maps)! Why is #3 not available at Paizo?